The Getty is an international cultural and philanthropic institution devoted to the visual arts and the humanities that includes an art museum as well as programs for education, scholarship, and conservation. The Getty Center opened to the public in December 1997, unites the J. Paul Getty Trust's museum, institutes, and grant program on one site in Los Angeles. It has received well over one million visitors per year. Situated in the Santa Monica Mountains off the 405 freeway in the historic Sepulveda Pass, the campus, designed by American architect Richard Meier, consists of six low-lying buildings on 110 acres. The Getty Center features a new J. Paul Getty Museum, distinctive buildings housing the Getty Research Institute for the History of Art and the Humanities, the Getty Conservation Institute, the Getty Education Institute for the Arts, the Getty Information Institute, and the Getty Grant Program, and the Central Garden designed by artist Robert Irwin. Located near the San Diego Freeway (interstate 405) and the Santa Monica Freeway (interstate 10) in Los Angeles, the Getty Center is the new home of the J. Paul Getty Trust, a foundation devoted to the visual arts and the humanities. The main public destination on the six-building campus is the new J. Paul Getty Museum which features European paintings, drawings, illuminated manuscripts, sculpture, decorative arts, and American and European photographs, changing exhibitions, and a wide range of programs for visitors of every age to enjoy, including gallery talks, lectures, film screenings, concerts, and family activities--most offered in both English and Spanish. The Getty Research Institute Library at the Getty Center is a resource for scholars, college and university faculty, graduate students, curators, and independent researchers. The Getty Center experience includes breathtaking views of Los Angeles, the Santa Monica Mountains, and the Pacific Ocean, a choice of places to snack and dine, extensive gardens, and programs sponsored by all the Getty organizations which, in addition to the Museum, include the Getty Research Institute for the History of Art and the Humanities, the Getty Conservation Institute, the Getty Information Institute, the Getty Education Institute for the Arts, and the Getty Grant Program. "We are building the Getty Center to be a cultural resource for the city of Los Angeles," said Harold M. Williams, former president and chief executive officer of the J. Paul Getty Trust. "We hope that its visibility from many parts of the city will serve as a magnet for visitors and as a reminder of the vital role the arts can play in our lives. We intend for it to attract and serve a broad public--people from Los Angeles and from around the world, young and old, who will come there to enjoy and study art and cultural heritage in an inspiring and stimulating setting." Getty Center visitors park in a 1,200-space structure and ascend the hill in an electric tram for the five-minute ride to the central plaza. An inviting staircase there leads them into the Museum and other parts of the campus, which features a full-service restaurant, two cafes, a Museum bookstore, and an auditorium seating 450, as well as the Research Institute's exhibition space, resource collections, and a reading area within the 750,000 volume library. Gardens and terraces throughout provide sweeping views of Los Angeles, the mountains, and the ocean. The gallery space of the new J. Paul Getty Museum at the Getty Center is more than twice that of the present Museum in Malibu. Five two-story Pavilions, interconnected around an open central courtyard, house changing exhibitions and the expanding permanent collections of pre-20th-century European paintings, drawings, illuminated manuscripts, sculpture, and decorative arts, and 19th- and 20th-century American and European photographs. Paintings are seen in galleries with natural skylights and visitors are free to see works of art chronologically or to enter individual Pavilions through the courtyard in any sequence they wish. Special viewing hours for school children and their teachers, lively family programs, and interactive media are some aspects of the educational programming. Visitors can also attend gallery talks, lectures, films, concerts, and art demonstrations sponsored by the Museum and the other Getty organizations. 1954 : J. Paul Getty Museum opens to the public in Getty's home in Malibu. Getty's collections of antiquities, French decorative arts, and paintings are on view. 1974 : The newly-constructed Villa opens on same grounds as the second home of the J. Paul Getty Museum. 1976 : Death of J. Paul Getty. Getty oil stock worth $700 million left to Museum. Lawsuits prevent distribution to Trust until 1982. 1983 : Land acquired in Los Angeles for new Getty Center. 1989 : Ground is broken at the site of the new Getty Center. 1996 : First office buildings at the Center completed and occupied, by Conservation Institute, Information Institute, Grant Program, and Trust. July 6, 1997 : Museum at Malibu to close. 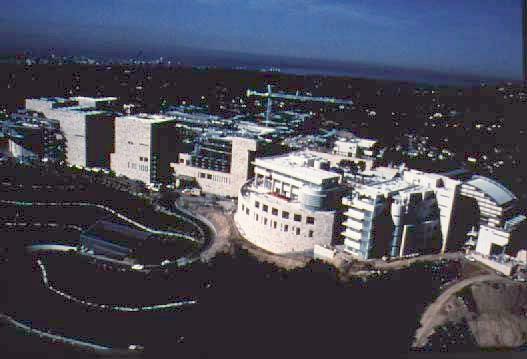 December 1997 : New J. Paul Getty Museum at the Getty Center to open to the public. 2001 : Projected re-opening of the Villa as a branch of the J. Paul Getty Museum and collaboration venture of Getty Trust for study, conservation training, and education in ancient art and comparative archaeology. All of the Museum's collections will move to the new Museum at the Getty Center in Los Angeles with the exception of antiquities. The Villa in Malibu, which closes in July this year, will re-open in the year 2001 with the antiquities on view as part of a new center for comparative archaeology and cultures. The period of closure will be used for renovation of the building in order to meet safety and access codes and to reflect the Roman origins of the Villa more accurately. "When J. Paul Getty decided to re-create an ancient villa to serve as the Museum, he did so because it seemed most appropriate for the Greek and Roman art collection to be displayed in the kind of building in which it might originally have been seen," said Dr. True. "It is our hope that the new, expanded mission for the Villa, which unites the exhibition of works of art with research and conservation activities, will serve to enhance his original vision." Antiquities were at the heart of the original collection formed by J. Paul Getty. 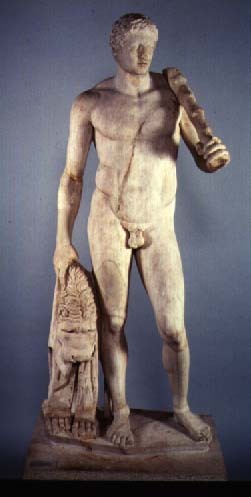 His first purchase of classical art was a small terracotta sculpture bought at auction in 1939. By the time of Mr. Getty's death in 1976, the collection of ancient Greek and Roman art was one of the most important of its kind in the United States. The collection has grown steadily in the past decade as plans for the new Museum and renovated Villa have progressed. Examples of sculpture--always a great feature of the collection--have been further strengthened, while the holdings of ancient Greek and Italian vases have grown to become the most significant feature. The collection's scope has been extended to include fine examples of Egyptian portrait painting and cast bronze portraits from the Roman Empire. An already important collection has been made even more so by the addition of about two hundred extraordinary and important works from the collection of Barbara and Lawrence Fleischman, part donation and part purchase, in 1996. Antiquities will not entirely disappear from view during the years of the Villa renovation. Some will form the major part of the first exhibition at the new Museum at the Getty Center, provisionally titled The Classical Legacy: Art as Artifact, which is a collaborative exhibition between several Getty entities, inviting visitors to explore antiquity through the eyes of archaeologists and researchers, and giving a preview of the Villa as it will be after reopening. From 1999 onward a selection of objects from the collection will periodically go on view in the new Museum at the Getty Center. Many ancient sculptures were purchased by Mr. Getty, and remain among the most important items in the collection. These include a portrait head of Alexander the Great made at the end of the fourth century BC, a group of terracotta figures showing a musician and sirens, made in the early fourth century BC, and the Lansdowne Heracles, of about A.D. 125. 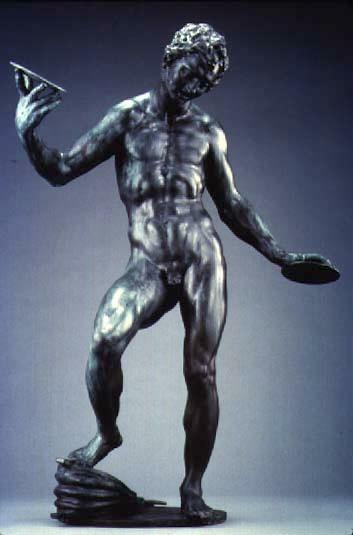 Among major acquisitions made since Mr. Getty's death are the Victorious Athlete, a Greek bronze statue of the late fourth century BC, and a number of early Cycladic marble sculptures. One of the greatest purchases was the Walter and Molly Bareiss collection of Greek and Italian vases. The objective of this department over the past dozen years has been to collect the finest available European paintings from the 14th century to the end of the l9th century, including important works by the French Impressionists, masters of the Dutch, Flemish, and French Schools, and fine Italian Renaissance and Baroque paintings. Among the recently acquired works are great paintings by Bernardo Daddi, Fra Bartolommeo, Pontormo, Monet, Renoir, and Cezanne. Large paintings that have been held in storage at Malibu will be displayed in spacious new galleries at the Getty Center. At last, visitors will be able to step back from these larger works and experience them the way they were meant to be seen. The 20 top-lit galleries, with their advanced daylight control system, will enable the paintings to be seen in the natural light in which they were painted. "We will be able to display 25 percent more of the collection than was possible in Malibu, and in an exceptional lighting environment," said David Jaffe, Curator of Paintings. "Our policy has always favored displaying paintings in the best possible condition, and they will sparkle in the new galleries." Although J. Paul Getty did not consider himself a collector of paintings, during his lifetime he nonetheless created a collection that represented European painting from the 13th to the 19th century. When Jaffe joined the Museum as Curator of Paintings in 1994, this collection had expanded substantially. "Getty recognized that significant paintings were difficult and expensive to acquire," commented Jaffe, "and the Museurn has not tried to build an encyclopedic collection. We have been able to balance it out over the past decade or so to include important early paintings and to strengthen the Italian, French, and Dutch schools. It has been transformed from a relatively small personal holding to a moderately sized but choice collection of fine works." The paintings collection includes European works of art in oil, tempera and pastel from the 13th century to the end of the 19th century. 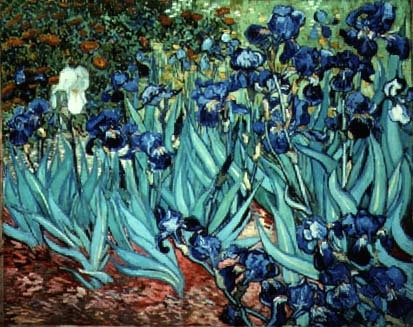 Public imagination has been especially captured by the French Impressionists, including the famous 'Irises ' by Van Gogh. The collection also includes significant works by Masaccio, Rubens, Titian, Veronese, Rembrandt, and other great masters. Among Mr. Getty's original collection are three important portraits, one by Van Dyck, one by Gainsborough and another by Rembrandt. For over a decade, this department has been quietly acquiring a remarkable collection of European sculpture and artistic treasures that will only be fully revealed once the new Museum opens at the Getty Center. Less than half of the collection can be shown in Malibu. The eight sculpture galleries in the new Museum will allow much more of the collections to be shown at one time. "We have kept a low profile while building this collection," explains Peter Fusco, Curator of Sculpture and Works of Art, "but we never intended to keep these things secret, as they were always intended for display in the new Museum. Much has languished in storage at Malibu for lack of space. In the last twelve years we have been able to significantly augment the original, fairly modest collection." The collection now contains some exceptional Renaissance bronzes, ceramics, and glass, as well as Baroque sculpture, Italian furniture from the 16th- to the mid-19th century, and objects in terracotta, gold, silver, and other precious metals. It includes important works by Antico, Cellini, Giambologna, Bernini, Houdon, Carpeaux, and de Vries, among many others. The department has also been collecting authentic period pedestals on which to display sculpture. "This is an aspect of the collection and new display that I am very excited about," commented Fusco. "To see works mounted on marble pedestals of the same period is something you usually find only in the grand houses and palaces of Europe. It's a rare opportunity in America." The Department of Sculpture and Works of Art collects European sculpture from the Middle Ages to the end of the l 9th century. Its collection of Northern European decorative arts from prior to 1650 and from Southern Europe from 1650 to 1900 complements the Museum 's holdings of 18th-century French decorative arts. The Museum's collection of drawings by great masters has grown rapidly in the last ten years and now numbers about 500. Selections will go on display in changing exhibitions in the dramatically presented new gallery at the Getty Center, which is about twice the size of the display space in Malibu. The collection was begun in 1981, four years after Getty's death, with the purchase of a chalk drawing by Rembrandt. The fast growth of the past decade reflects the Museum's aim to build a representative historical collection, with emphasis on the most important and brilliant draftsmanship in the Western tradition. Drawings are sensitive to light and therefore cannot be exhibited continuously. The carefully designed showcases, produced by Helmut Guenschel Inc. of Baltimore and Glasbau Hahn of Germany use fiber-optic lighting that allows light to be directed very specifically at acceptable levels. This planning process, along with the design of the new gallery, has taken several years, developing alongside the construction of the new Museum building and the growth of the collection. Since Nicholas Turner's appointment as curator of this department in 1994, he has considerably strengthened the Museum's holdings of 16th- and 17th-century drawings, but also expanded the collection into the 18th and l9th century. He came to the Getty from the British Museum in London, where he specialized in Italian drawings, and more recently in French l9th-century drawings. Catalogues prepared by Turner are now standard works of reference on the great masters of the Renaissance and on some of the world's most outstanding drawing collections. "Drawings have very precise requirements for the kind of environment they need, and the kind of lighting to which they can be subjected," said Turner. "We are delighted with the conditions we will be able to create in the new gallery. The cases will meet a very tight specification to keep the drawings in good condition, but we think they are going to look splendid too, allowing flexible installations of many drawings at a time. From our point of view, the really exciting prospect is being able to show more material and to draw out items from the collection to illustrate particular themes and ideas. We are planning exhibitions that will show the very best of the collection, but also ones that will explore interesting subjects needing space that we simply have not had before." Past years have seen the acquisition of works by Raphael, Durer, Bernini, Rubens, Veronese, Poussin, Ingres, David, and Cezanne. 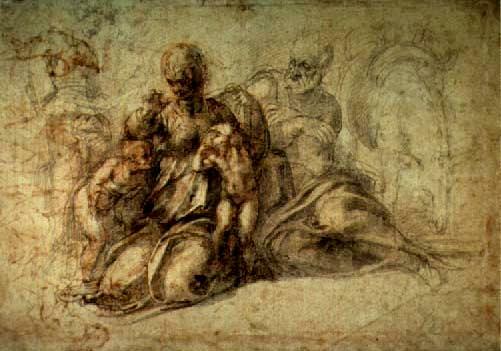 Perhaps the most notable work in the collection is a drawing of the Holy Family by Michelangelo. "This is a subject that was very important to Michelangelo," explains Turner. "He returned to the theme of the Madonna and Child, or the Holy Family again and again. This is a great drawing, giving us real insights into the way the artist worked. Drawings of this quality need to be seen under the best possible conditions, and that is exactly what we are aiming for." The drawings collection ranges from the second half of the 15th century through the end of the 19th century. It includes works executed in pen and ink, charcoal, watercolor and other media. Great artists of the past have used drawing to explore and develop ideas, and as a preparation for major projects. Among the more popular pieces in the Museum 's collection are a highly finished study of a stag beetle by Durer; sketches of a child with a lamb by Leonardo da Vinci; and a portrait of the Postman Roulin by Vincent Van Gogh. Lack of gallery space has prevented the Museum at Malibu from showing many works in this outstanding collection. Known mainly for its exquisite French late 17th-and 18th-century furniture including several important pieces by the great cabinetmaker Andre-Charles Boulle, it includes silver, ceramics, tapestries, and carpets. The collection will fill fifteen galleries in the new Museum at the Getty Center where it will be displayed to much greater advantage. Some items will be on view for the first time. Preparing objects for the new galleries has required delicate conservation work. Meticulous attention to detail over many years has gone into planning the layout and proportion of the new galleries, together with the choice of finishes and colors. Gillian Wilson has been curator of the department since 1971, when she was hired by J. Paul Getty, the founder of the Museum, late in his life as he began to extend the collection more vigorously. In those days, there were about 30 objects. Today there are over 400. Few curators have had the opportunity to build a collection so rapidly, or be involved in the building of first one museum--the Villa at Malibu--then another, the new Getty Museum at the Getty Center. "I am particularly proud of our holdings of furniture made in Paris from the 1670s to 1720s," says Wilson. "These include some of the finest examples in the world of French furniture made in the reigns of Louis XIV and Louis XV." Preparation for installation has included conservation, in Paris and Malibu, of four 18th-century paneled rooms, two of which have never been on public display. Along with the furniture will be tapestries, many in a rare state of preservation; beautiful chandeliers; wood and bronze worked with remarkable craftsmanship; and fine ceramics with many historical associations. Works being prepared for display include one 24-foot-long tapestry that has not been exhibited for many years. Since 1987, the department has worked closely with the Office of Thierry Despont, the New York based firm that has been responsible for the interior architecture and design of these galleries as well as for the finishes used elsewhere in the Museum. Plans to line seven of the 15 rooms with French silks specially woven from traditional damask patterns have involved detailed collaboration with French companies which themselves have records dating to the 18th century. Together with other decorative and architectural details, these fabrics will help to create a suitable ambiance for the display. Among the works to be seen for the first time is a series of six large tapestries, glowing with color, showing the History of the Emperor of China, made for the second son of Louis XIV. "The collection required surroundings of suitable scale and decoration, closely tied to the interior architecture of the period and using the correct colors, textures, and details," explains Wilson. "The new galleries will be a museum within a museum." 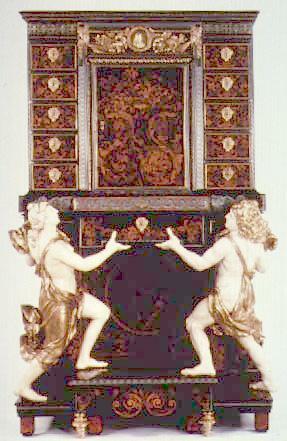 J. Paul Getty began to acquire furniture in the late 1930s and continued to acquire slowly until the 1960s. When he opened the original small museum in his home in Malibu, the entire collection of decorative arts, consisting of about thirty objects was housed in two galleries. Soon he began to plan a bigger museum. With the prospect of opening the Villa in 1974, Mr. Getty began to acquire more vigorously in the early 1970s to his death in 1976. In this period strong roots were put down, and the conception began to be realized forming a representative collection of French decorative arts from the reign of Louis XIV (16431715) through the end of the reign of Louis XVI (1774-1792). Despite their important place in the history of European art, illuminated manuscripts (books written and decorated entirely by hand) have not found their way into many American art museums. The Getty Museum is therefore exceptional in holding an important collection of illuminated manuscripts of the Middle Ages and Renaissance which it displays in rotating exhibitions year-round. At the opening of the Getty Center, about 45 of the Museum's most splendid examples will be on view. Thomas Kren, Curator of Manuscripts since 1984, played a major role in the research and deliberation that led to the Museum's acquisition in 1983 of the collection of more than 100 illuminated manuscripts assembled by Peter and Irene Ludwig. The Museum's collection has continued to grow in size and importance, with more than 60 subsequent acquisitions. It presents the history of manuscript illumination from the 10th to the 1 6th century in Western Europe and the Eastern Mediterranean. Recent acquisitions include an outstanding early 16th-century manuscript illuminated by the Boucicaut Master, which will go on public display for the first time at the Getty Center. "We mount four exhibitions of about 20 manuscripts from the permanent collection each year," said Kren. "Some focus on a particularly important manuscript in the collection, while others are arranged around historical themes. We endeavor in each exhibition to offer a glimpse of the art and culture of the Middle Ages and Renaissance, while also ensuring continued variety for our return visitors." Past exhibitions have provided new perspectives on the art of the great illuminator and panel painter Jean Fouquet, the relationship of art and science in the Renaissance, and the book arts of the Persian capital of Isfahan. Several years of research and planning lie behind the presentation in the new Museum. Most important in this regard are the specially designed display cases with fiber-optic lighting that are now being fabricated by Helmut Guenschel Inc. of Baltimore and Glasbau Hahn of Germany. Manuscripts, or handwritten books, were the primary vehicles for the written word from the centuries after the death of Christ through the tenth century. During this era illustrated books, called illuminated manuscripts, were a major art form. The types of texts illuminated include liturgical and devotional books, scripture, theology, law, philosophy and literature. The Museum 's collection includes masterpieces of the Middle Ages and Renaissance, made in Germany, France, Belgium, Spain, Italy, England, Poland, and the Eastern Mediterranean. Past exhibitions have won praise for showing new perspectives on subjects such as Alexander the Great and the Art of Isfahan. The growth and broadening of the Getty's collection of photographs is perhaps the most spectacular of all the developments at the Museum since 1984. It was started in that year with the acquisition of several exceptional private collections that immediately established the Museum as a world center for photography. "If our entire collection of some 60,000 photographs could be exhibited at one time, we would need 30 miles of wall space," quipped Weston Naef, Curator of Photographs. "Fortunately, we-prefer the strengths of our collection distilled like cognac into small rotating exhibitions, with the very best by the great individual photographers carefully selected to communicate their genius and to whet visitors' appetites for more." The quality of the collection is widely acknowledged. Picture for picture, it may be the finest comprehensive collection in the world, containing extensive holdings of all periods, styles, and important makers before 1960, each built up by demanding collectors. 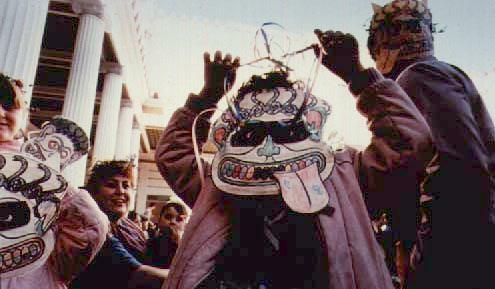 Weston Naefjoined the staff of the Museum upon the formation of the collection in 1984. Under his guidance, the department has concentrated upon acquiring bodies of work by the finest individual masters, spanning the period in the 1830s immediately following the birth of photography through the 1960s. In three photographs galleries in the new Museum, much more of the collection can be shown at any one time. The design of these galleries and their lighting has been lengthy and painstaking, as has the process of creating galleries for other works of art on paper. The department will continue its tradition of medium-sized exhibitions focusing on particular themes or on the work of individual artists such as Julia Margaret Cameron, Alfred Stieglitz, Doris Ullman, Carleton Watkins, Edmund Teske, and Frederick Sommer, among others. Time Not in Motion, the first exhibition to be mounted by the department at the Getty Center, will explore the theme of time--whether captured or remembered--in l9th and 20th-century photographs. Photographic exhibitions are among the most popular to be presented by the Museum. This is the only part of the collection to encompass American art and extend into the 20th century. The Museum decided to collect in this area in the early 1980s for the same reason it decided to collect drawings and manuscripts: it saw photography as an art fundamental to its time in which individual works of great rarity, beauty and historical importance have been made. The collection contains work by many of the great American and European photographers, from the early achievement in the 1830s by William Henry Fox Talbot to those of the modern masters, including Andre Kertesz and Walker Evans. For the past five years, in keeping with the Museum's philosophy and in preparation for the move to the Getty Center, the J. Paul Getty Museum Education department has evolved into one of the largest art museum education divisions in the country and the biggest department within the Museum. It has a staff of more than 30 people working with the Los Angeles community to help demystify the experience of the art museum and to reveal it as a friendly and rewarding place for a broad audience to visit. "Because our mission is to serve the widest possible audience," said Diane Brigham, Head of Education, "we've focused on making the new Museum accessible, not just physically, but intellectually and emotionally. We listened to what visitors said they needed, and we are incorporating a variety of points of view in the interpretation of the collection and employing an ever-growing array of teaching approaches." Brigham and her staff have been collaborating with educators throughout Los Angeles in an effort that has ranged from audience focus groups in which visitors were asked to critique gallery labels to collaborative projects that help community members use the resources of the Museum more effectively. "At the Museum in Malibu we are succeeding in gradually attracting a wider and more diverse audience," she said. "We plan to expand on this success. Future visitors will be greeted with an atmosphere of learning, fun, and curiosity. Our initiatives recognize that it takes a range of voices and approaches to explore art. Understanding the various perspectives of the experts, artists, and others who study, care for, and are inspired by the art can help our Museum come alive for visitors. Ultimately, we want to help visitors make their own connections with the art, relating it to their own lives and current social issues." Improved programs and new services, now several years into planning for the new Museum, will include a random-access audio guide, architecture and gallery talks, concerts, evening events for college students, parent workshops, family festivals, multiple school visit programs, a teacher resource room, and studio facilities for arts activities. Four information centers adjacent to the galleries will offer hands-on activities, multi-media presentations, and demonstrations related to the nearby collections. Bilingual family programs, storytelling, and gallery game boxes will be expanded with the addition of the Family Room, a place where people with children can start their visit or join in the participatory activities. A project called "Make the New Museum Your Museum" has formed two pilot partnerships with after-school centers. This will challenge young students to think about the functions of a museum and the nature of the arts. Getty staff will conduct workshops, both in the community and in the Museum, that will train teachers how to use museum collections as an inspiration for their students not only to create art but to look, write, and talk about it. The Museum 's audio guide is being developed with Antenna, a California-based, nonprofit arts organization. It will use CD-ROM technology, giving visitors many options in designing their own guided tour through the galleries, and will be available in English and Spanish. The company has done similar work for the Vatican Museums, the American Museum of Natural History, and the San Francisco Museum of Modern Art. Partners of the J. Paul Getty Museum for the "Make the New Museum Your Museum " project from within Los Angeles include the USC Family of Five Schools Program, composed of the Foshay Learning Center, 32nd Street/USC Magnet, Vermont School, Norwood and Weemes Elementary Schools. The Museum is also working with the After School Activity Program which has 24 school and community sites in different parts of Los Angeles. It is closed Mondays and major holidays. Admission to the Getty Center is free. Parking is $5 per car. No parking reservations needed on Saturdays and Sundays or after 4 p.m. on weekdays. Visitors may also arrive by other means, such as public transportation (MTA #561 and Santa Monica Big Blue Bus #14), taxi, or local shuttles. For information and reservations, call 310-440-7300. The TTY line for callers who are deaf or hearing impaired is 310-440-7305. Unknown Roman sculptor, ca. A.D. 125 . Discovered near Hadrian's Villa, Tivoli, ca. 1790 Pentelic Marble 76 3/16 in. ca. 1530 Michelangelo Buonarotti (Italian, 1475-1564) Black and red chalk with pen and brown ink over stylus 11 X 15.5 in. 1889. Vincent van Gogh (Dutch, 1853-1890) ; Oil on canvas 28 X 36 5/8 in. 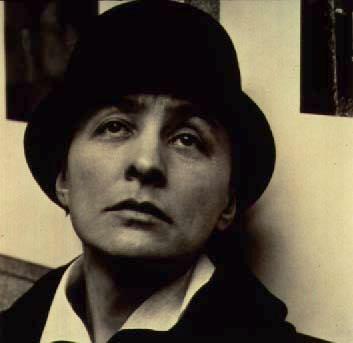 1923 Alfred Stieglitz (American, 1864-1946). Palladium print 7 1/8 X 7 1/4 in. Paris, about 1680. Attributed to Andre-Charles Boulle (French, 1642-1732). Oak veneered with tortoise shell, brass, pewter, horn, ebony, ivory and with marquetry of stained and natural woods; drawers of snake wood; figures of painted and gilded oak; gilt-bronze mounts 7ft.6 1/2in. x 4ft. 11 1/2 in. x 2 ft 2/4 in. ca. 1610-1615 Adriaen de Vries (Dutch, 1545-1626) Bronze H: 30 1/4 in. ; W: 20 3/8 in. ; D: 8 5/8 in. ca. 1415 Boucicaut Master (French, active ca. 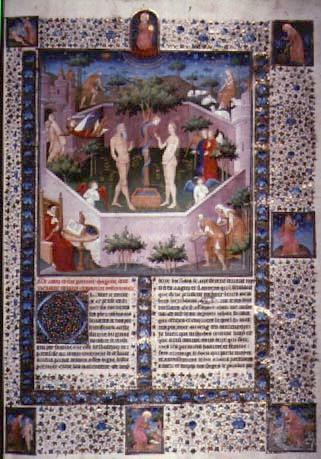 1405-1420) and workshop of Boucicaut Master from Boccaccio, "The Fates of Illustrious Men and Women" (Des cas des nobles hommes et femmes). Tempera and gold on vellum Leaf: 16 3/4 x 11 9/16 in.